Ultra-bright and rechargeable – what more could you ask for in a work light!? SCANGRIP Sunmatch easily shows you which areas on your paint needs more work using the ultra-bright LED bulb. The first step to determine what type of detail you’ll be doing on a car is by fully inspecting the condition of the paint. Many people prefer to do this step outdoors in direct sunlight, but that is not always possible thanks to the elements. When going outside to evaluate is not an option, you need a quality “swirl finder” light that will show you what work needs to be done. 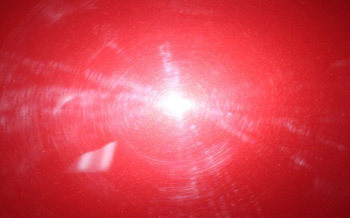 Swirls and scratches in paint, no matter how small and insignificant, can inhibit the gloss on your car. The key to correcting those small imperfections is by first, seeing them! SCANGRIP Sunmatch easily illuminates your paint to show to you every divot, scratch, or scuff on your paint. By featuring a two-step operating option, Step 1 at 100% and Step 2 at 50%, you’re able to customize the SCANGRIP Sunmatch to your needs. Situated on an adjustable base, SCANGRIP Sunmatch can tilt up to 180 degrees, easily brightening your work space. If you’d rather carry it while working (perfect for doing quick spot checks! ), simply hang SCANGRIP Sunmatch by the included sturdy hook. SCANGRIP Sunmatch even works while charging! The wall mountable charging base with magnetic bottom fixes it to your working space. Featuring a heavy duty hook and a magnetized bottom, SCANGRIP Sunmatch can follow you through any detail project and provide ample illuminaton! 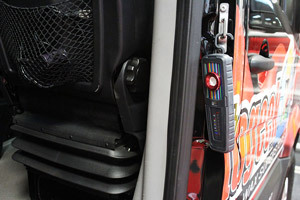 SCANGRIP Sunmatch features a durable construction, is water resistant, and features an IP rating of 65 to keep dust from damaging valuable interior components. 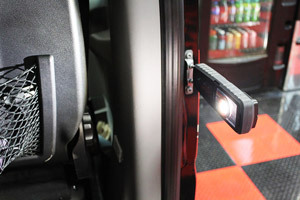 If you’re looking for a heavy duty, ultra-bright, and portable light perfect for find those hidden swirls, pick up the SCANGRIP Sunmatch today! 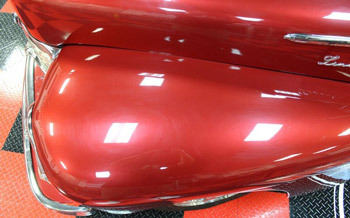 Even under fluorescent lighting, the panel on this red 1947 Lincoln Zephyr paint doesn't look so bad. However, once you use the SCANGRIP Sunmatch light, you'll see just how much work needs to be done to make these "invisible" swirls and scratches disappear for good!